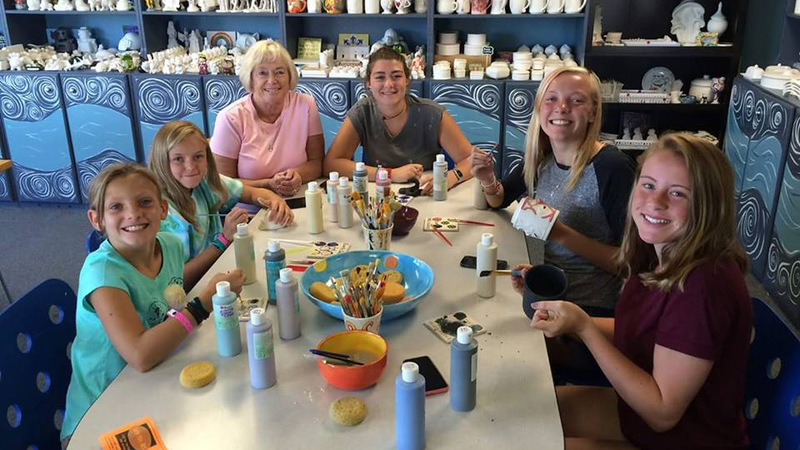 Earth Fire Art, a paint your own pottery studio located on Bend’s east side across from Wagner Mall offers a relaxing creative space for artists of all ages and abilities. Walk-ins are welcome, but you can reserve space in advance. You have the option of an Open or Closed Studio Party for your event, ranging from birthday parties to corporate team building. Pottery costs between $5 and $150 per piece, with many favorite pieces in the $14 to $30 range. Prices include the pottery pieces, use of the studio and supplies, glazing and firing. Most people spend about 1 to 1½ hours at the studio, and they have lots of idea books, samples, and fun tools, as well as a studio staff that is available to help. Painted pottery is ready to pick up in about one week, to allow it to dry, get dipped in a clear glaze, and fired in their kiln. Earth Fire Art will hold finished pieces for 30 days.